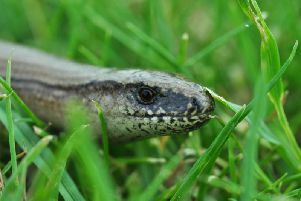 Experts have issued a warning that 'aliens' are threatening Britain's rarest reptile, after European lizards have moved over from the continent - and are killing our native species. Experts are now urging the public to keen an eye out for the 'alien' lizards so they can keep tabs on local wildlife figures. He said: "They could have a competitive interaction with native lizards, the main focus of my study is to quantify where wall lizards have increased and where native ones have declined. "There is a lot of evidence to suggest that the wall lizards are increasing and the sand lizard is in trouble, they are suffering in terms of their habitat loss. "There is a major reintroduction process going on for the sand lizard. "Wall lizards have been in Bournemouth since the 1960s and they are quite common, but since the wall lizard have been there it is very hard to find sand lizards, they are one of the rarest reptiles in Britain. "They both share the same habitat and compete for the same food resources. "If wall lizards reach seriously invasive stages it could have an impact on bugs and butterflies on the flip side they could provide a food source for birds of prey like kestrels." He added: "Wall lizards are very easy to spot basking on sunny days. "Considerable survey effort is required to get around to all the known wall lizard sites and there is a need for updated population surveys, assessment of range expansion, and of course identification of new populations. "The public can help us assess just how widespread the lizards are in the UK and make a valuable contribution to this project by reporting your own wall lizard sightings, whether locally or further afield." Sand lizards, native to Dorset, Sussex, Kent and Hampshire are facing a dramatic loss in habitat prompting wildlife campaigners to introduce a captive breeding programme.